Drizzle Heinz ketchup over hamburgers and hot dogs, and give your customers the classic condiment they crave! Using only the finest ingredients, Heinz makes their ketchup from the firmest, ripest, juiciest tomatoes. Rich, smooth and vibrant red in color, your guests are sure to fall head over heels for this condiment packaged in an iconic glass bottle. Ketchup provides a savory, slightly sweet taste that's great for dunking mild fried foods like French fries in a cool, flavor-rich sauce. It's also great for making baked beans, marinades, chili sauce, and barbeque sauce. Use this ketchup, and treat your patrons to the classic taste they grew up with and still love! For over 140 years, the Heinz company has a history of being committed to environmental sustainability and community outreach, while growing their own tomatoes from the seeds they themselves produce. The tomatoes are packed full of nutrients, including essential vitamins, minerals, and lycopene, a healthy antioxidant found in cooked tomatoes. Trust Heinz for your condiment supply, and stock your pantry with Heinz ketchup. This ketchup is gluten-free, so it's sure to please all of your customers. Offering rich, tangy flavor and a smooth texture, this ketchup is sure to become a staple in your establishment! This item is certified Kosher by the Vaad Hoeir of St. Louis. This is Heinz Ketchup. This is a pretty decent price on a bottle or a case. If you need to read my review of heinz ketchup then you shouldn't own a restaurant. Great Ketchup, My family has used this for a long time and is always perfect and high quality. I always prefer the Glass Bottles to the plastic ones. 5 Stars out of 5! It's nice to still be able to buy Heinz ketchup in these glass bottles - both because it's more eco-friendly than plastic, and because it's just so classic looking! Love the classic look the glass bottle gives to the ketchup. There is no better flavor than Heinz. Love having this bottle around for parties and gatherings! I prefer the glass ketchup bottles as I can reuse them and fill with bulk Heinz ketchup. The glass is easy to wash out in between fills and is small for efficient storage. Heinz ketchup is great tasting and somehow the bottle presentation makes it seem like it tastes better. I love the flavor and design of this ketchup. You can of course purchase bulk ketchup for a lesser price than buying bottled, however these glass bottle ketchup containers are enjoyed by customers and a perfect fit for many classic diners. I'm pretty sure most people are familiar with this particular type of ketchup and bottle but either way, it's a solid bottle, which is nice if you dont want to deal with plastic. the ketchup is heinz which is classic and a flavor most people are familiar with. the price is decent (bulk ketchup is way, way cheaper though). overall it's a decent deal on a pretty commonly used condiment. This is the classic glass ketchup bottle. We use them on our tables for the customers to apply to their food. You can rinse and refill the bottle if necessary. I am in love with the classic design of this ketchup bottle. It just screams good, greasy spoon diner and seeing it on a table makes me instantly happy. Ketchup in a glass bottle is the picture of a 1950s diner. It's not as easy or clean to dispense but it's a lot nicer looking on a table. Heinz has always been a household tradition. We ordered the glass bottle for the sleek classic look that it provides. The ketchup remains fresh and dispenses with ease. We are pleased to add this addition to our kitchen condiments. This is the name brand of ketchup. The taste of Heinz is far and away superior to other off-brand ketchup. Treat your customers right with this staple item! I like being able to pick up a single bottle or two for home. Heinz is ketchup! The classic ketchup bottle is so nostalgic and well known. Although it doesn't beat the ease of the squeeze version, there is something still fun about tapping on the bottom of the glass bottle to get the great ketchup out! What can I say, Heinz ... The best ketchup ever! And love the classic glass bottles! Taste is out of this world. And the name you can trust! This was a nice size Heinz ketchup bottle that is not too large for small table gatherings and for storing in the refrigerator or pantry area. "The best things come to those who wait!" If you were alive in the '80s, you know exactly what this means. The slogan was meant to emphasize the thickness of the product, as a trademark of quality, and that slow pour out of the glass bottle meant the reward of such a high-quality condiment on your food. This is the CLASSIC old Heinz, the way it has been served for decades. I am always impressed to see it this way on a table at a restaurant. The leader in ketchup. Customers know they are getting quality when they see it. Easy to pour out and to keep clean with a simple wipe. Heinz Ketchup! What else is there to say? It's a classic, especially served in this iconic glass bottle. If the ketchup gets stuck in the bottle, just hold it upside down and hit the 57 with your hand. Ketchup in bottles just as I remembered during childhood. Perfect for restaurants. 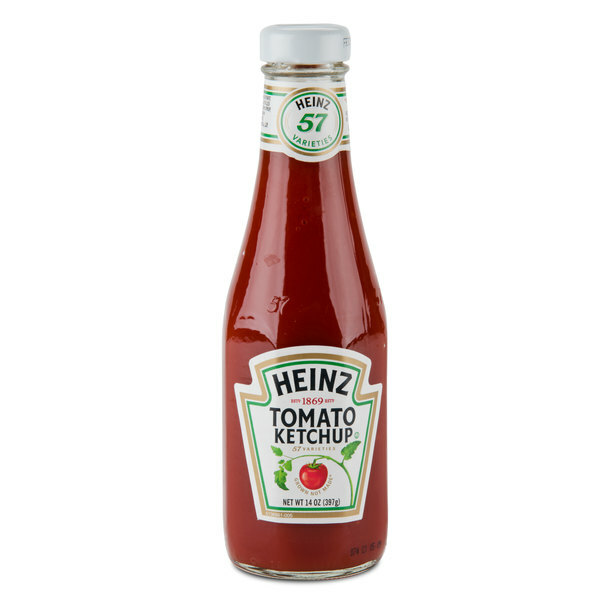 I compared brands and Heinz is the staple condiment for every table in any restaurant. The taste says it all. Excellent quality and delicious. The best ketchup of all and yes it still pours out slowly, the best price I could find on the market, thought shipping would be expensive but just combined with other items in my order, arrive in great shape, no damage.